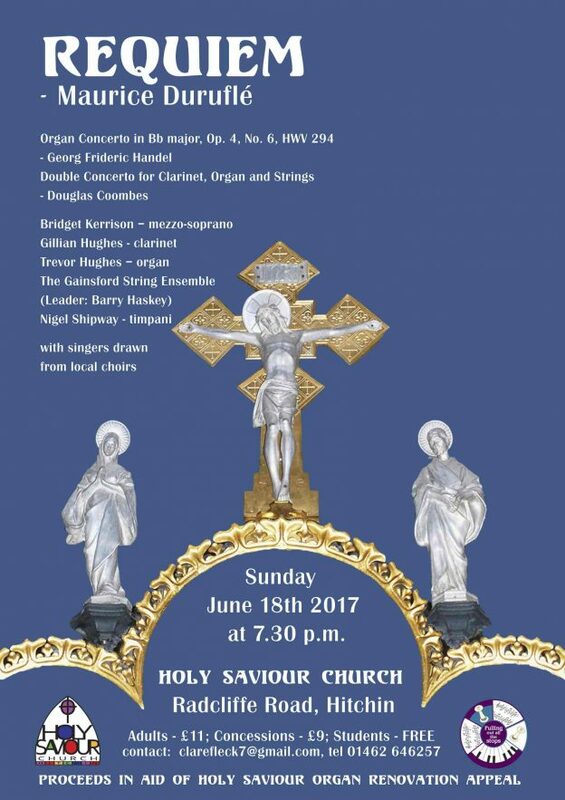 There will be an exciting concert to celebrate the renovation of the organ at Holy Saviour Church on Sunday 18 June at 7.30pm. Singers from our choirs and others in Hitchin and beyond, combine to sing the Requiem, by Maurice Duruflé. The programme will also include Handel’s Organ Concerto in Bb major, and Double Concerto for Clarinet, Organ and Strings by Douglas Coombes; soloists Trevor Hughes – organ, & Gillian Hughes – clarinet, conducted by the composer, with the Gainsford String Ensemble. Admission: £11; Concessions £9; Students Free. Proceeds in aid of the Holy Saviour Organ Renovation Appeal. For further information contact Clare Fleck (clarefleck7@gmail.com or 01462 646257). This entry was posted in Events on 12/05/2017 by admin.